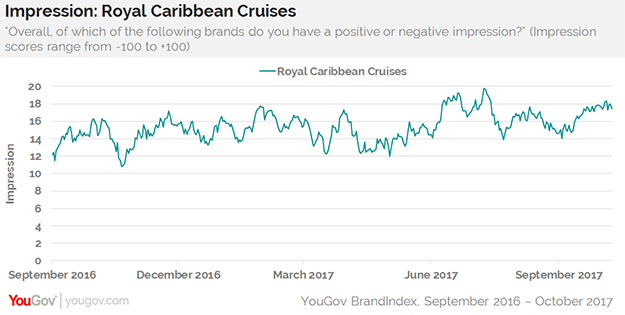 Royal Caribbean’s consumer perception has been climbing steadily since sending a cruise ship to evacuate residents in Puerto Rico and deliver supplies at the end of September, according to YouGov BrandIndex. On September 26, the cruise line announced it would cancel its September 30 Adventure Of The Seas trip so that the 3,800-passenger ship could rescue victims of Hurricane Maria, as well as make supply stops around the affected Caribbean islands. 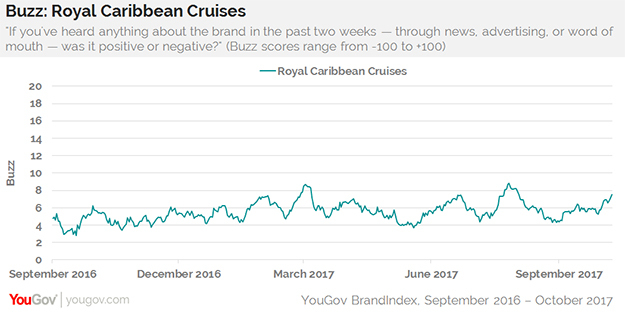 Two of YouGov BrandIndex’s metrics — Buzz and Impression — have been rising steadily for Royal Caribbean since that news broke. Buzz asks respondents, "If you've heard anything about the brand in the past two weeks — through news, advertising, or word of mouth — was it positive or negative?" while Impression asks, "Overall, of which of the following brands do you have a positive or negative impression?" According to YouGov Profiles, the company’s data segmentation tool, 17% of US adults who plan to take a cruise within the next 12 months reported hearing positive Buzz about Royal Caribbean in the past month, compared to 8% of the general public, suggesting that doing the right thing for the residents of Puerto Rico may also be good for business.